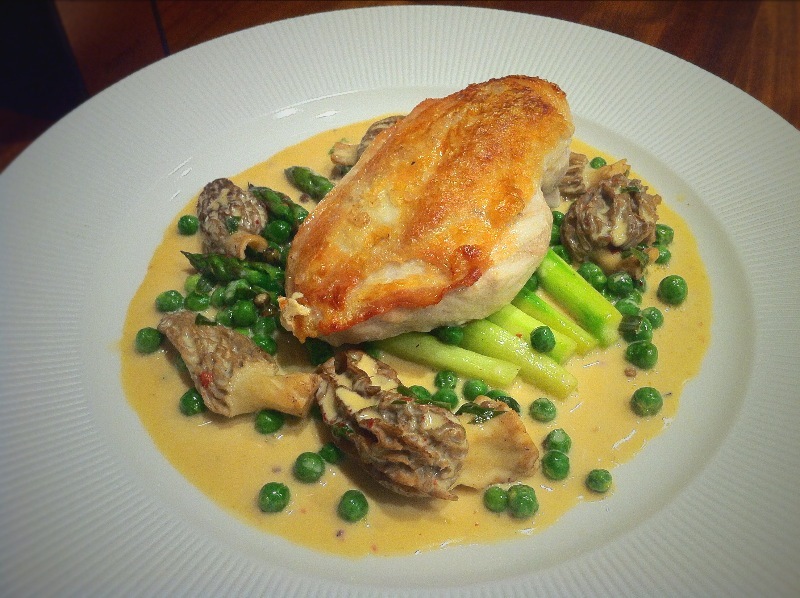 Roast Chicken with a Morel and Three Peppercorn Sauce. The old adage of not playing with quality ingredients holds strong in this dish of chicken and morels. 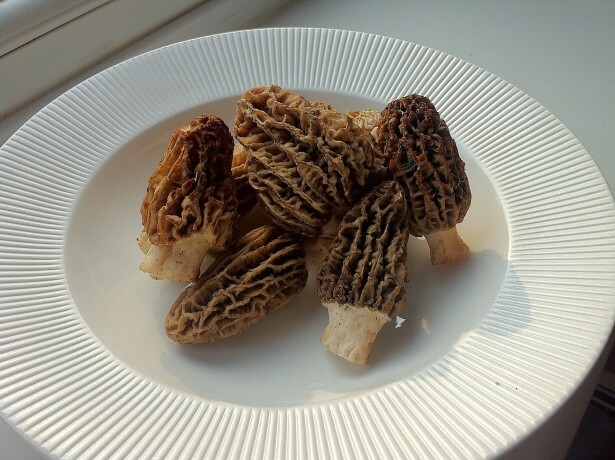 Morel mushrooms are actually harder to find than truffles, fresh ones especially. I’ve found them online at Fine Food Specialists in Covent garden, but they are roughly £100/kilo. Ouch. Amazingly though, I was browsing the shelves in Tesco and I nearly fainted to find them on the shelf! £2/100g so less than a quarter of the price normally. Not only do they look beautiful, but they are quite simply the tastiest mushroom bar none. They are hollow inside, with a thick body. The crinkled outside is perfect for absorbing sauces. I’ve often said that the difference between food at home and at restaurants is the quality of the sauces that marry the dish together. Today, I’ve thrown a little caution to the wind with this three peppercorn sauce. It goes with any meat and with the addition of the pink peppercorns it’s actually quite fruity and fresh. They are edible raw, but like any mushroom will shrink upon heating. When it comes to cooking them, I treat them like scallops, thirty seconds a side and as soon as they begin to shrink remove them and add to the sauce. To prepare them, they have to be washed. Mud gets into every nook and grannie. Just have a bowl of water and submerge each one and give them a good shake. Place on kitchen paper to dry. Mushrooms don’t absorb water by the way! Use any chicken stock you want. Homemade will create a michelin star sauce, freshly bought or from concentrate will make an excellent sauce. From a cube…..lets not go there, but if that’s all you have, use it. Cream wise, again use what your heart desires. If you’re trying to seduce someone, use double(heavy). if just making a nice supper and want to look after your arteries use single. Even better although you lose a tiny bit of authenticity is the long life UHT ones you find on the shelves. Especially single cream versions, which are only 150Kcal/100ml, plus you can boil these versions without them splitting. Normal single cream will split. Set the oven to 180°C Fan. Cook the chicken skin side down for 3 minutes. Turn over and transfer to a baking tray. Cook for 10mins. Let stand for 5. Crush all the peppercorns in a pestle and mortar. Add to the chicken stock and wine and boil until reduced by two thirds. Add the cream and check for seasoning. Add the peas and simmer for 2 minutes. Finally flash fry the morels in the same pan you used for the chicken for 30 seconds a side and add to the sauce. Finish with the tarragon. Serve pronto, with some mash on the side if you have hungry mouths to feed. Morels, tarragon, and cream…I know this is delicious! This looks truly michelin star worthy, David! Easiest dish I’ve ever made, Bonnie. Okay I cook the chicken in a skillet skin side down and turn over. How long on side two before putting it in the oven for 10 minutes? I really like this sauce! Straight away, Maureen. With the skillet being hot, it will keep cooking from underneath. I can just imagine how good this chicken was. Fresh morels are impossible to find in my rural area but I do keep dried ones in the fridge. Hi Karen, I know the fresh ones are rarer than gold. The dried ones should be good though. That’s easily the best dish I have read about today. Gorgeous, and the sauce sounds lip licking gobsmacling delicious. Have to hunt for fresh morrels..Whole Foods maybe? Just noted it on my list of groceries this week. If whole foods don’t have them, no one will. Good luck, Minnie. This is a gorgeous dish Dave! I can’t get morel mushrooms here in HK, but certainly can get many others and that 3 peppercorn cream sauce looks like a winner. A really beautiful spring dish! Hello! Looks delicious! Can you tell me what UHT stands for? Ultra Heat Treated. No idea what they do exactly, but it gives things a longer shelf life.